I usually give you a wee snapshot into my week on a Monday before I share the Meat Free Mondays recipes with you, but this week I thought I'd show you where I work. 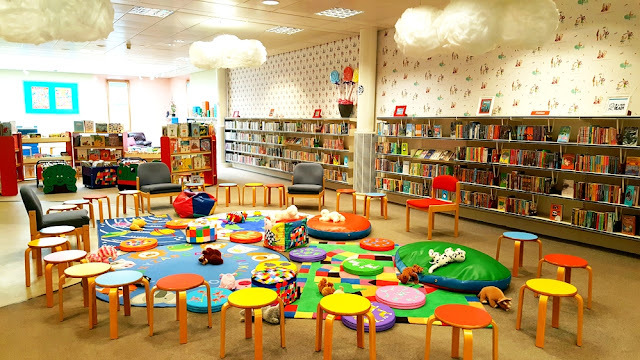 Doesn't it look lovely and colourful"
I work in a children's library. I've worked here for 20 years now and I can't tell you how much fun it is spending time with all the kids from babies to teenagers. I have a blast all week helping kids find just the right book, singing songs at Bookbug (rhyme time), telling stories to toddlers and doing crafts and activities with the kids in the holidays. I also have a knitting club for kids each week and a code club, where kids can learning computer coding. All that and I get to decorate the library and paint murals on the windows. Yes, they pay me for this! I used to work full-time, but I cut my hours when I had Cooper and then again when I got so busy with my blog, but I'm still there a few days a week having fun. So now I've told you a bit about my week, it's time to share some recipes with you. As usual they are awesome and a big thank you goes out to all the bloggers who contribute each week. I hope you leave inspired and go veggie at least one day this week.